"I'm thinking about building up a bikepacking bike," the 40-something customer told the shop owner. "I want something I can load up and take exploring." The shop owner nodded quietly, as he often does. The customer continued with a tale about how his racing days are over, about how he's ready for more adventure. But he's disappointed that his new trail bike isn't the bike for bikepacking. After a moment, he looked my way and asked what I ride for bikepacking. "I don't really have a bikepacking bike, per se," I replied. "But each of my bikes have done their share of long trips." I elaborated about my bikes and the endeavors they've had. The man looked surprised to hear that I've taken each of my bikes on multi-day adventures. I sensed that he was looking for an excuse to buy another new bike, but he also seemed a little relieved to realize that he could outfit his newer full-sus with bags and instantly have a "bikepacking bike." He walked out of the shop with a giddy expression on his face and the name of a local bikepacking bag company that makes flashy custom frame bags. "Well that was easier than building him another bike," the owner said with a wry smile, picking up a couple tools and returning to the 90’s-era bike hanging in the repair stand. In the past decade, I've bikepacked on almost every type of mountain bike: rigid hardtail, mid-fat, fat, tandem, XC-style full-suspension, long-travel full-suspension, fat full-suspension, steel, aluminum, titanium and carbon. I undeniably have my preference, which I'll expound upon below, but I first want to emphasize the fact that any bike–so long as it can be pedaled comfortably on trails–can be a great bikepacking bike. As bikepacking has rapidly gained popularity over the last few years, more bikes designed with mountain bike touring in mind are appearing in shops. Most boast larger front triangles to accommodate frame bags, extra braze-ons and bottle cage mounts. Many of the frames are spaced to fit wider tires. All these features sure can be nice, but they are by no means mandatory. 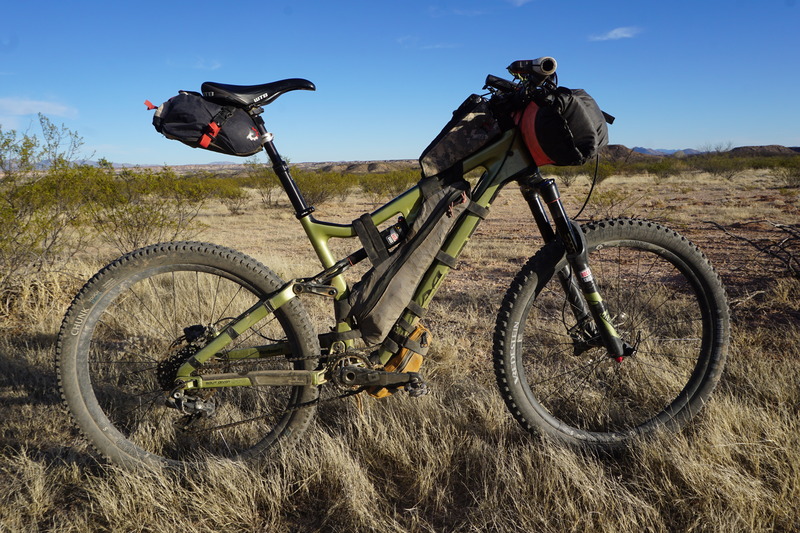 The bike I did the most bikepacking on this past year is a Salsa Redpoint, (editor's note: Kurt is a Salsa-sponsored rider) a 6-inch-travel bike that ended up being Ryan Palmer's Dream Build for 2016. Long-travel bikes like this aren't what come to mind when most riders think about bikepacking rigs, since much of the industry is trying to label them as "trail bikes." But here's the thing: the type of backcountry trails often faced on a bikepacking trip are frequently rugged, and trail bikes eat up the rough stuff. So why shouldn't these so-called "trail bikes" also be go-to bikepacking bikes? Here, I'll share why I've been bikepacking on my full-suspension trail bike and how I've customized my setup. I once gravitated toward hardtails and shorter-travel full-suspension bikes for bikepacking, fixated on the fact that these are lighter and more efficient over smooth surfaces. But after spending a week riding 14,000-foot peaks in Colorado, a few weeks touring from bike park to bike park in the Australian Alps, and a month bikepacking throughout New Zealand, weight and efficiency are no longer my main concerns. Now it's all about maximizing fun on the trail. Especially with a handlebar bag strapped to the front end, a slacker headtube angle makes a bike feel more stable at speed and on steep descents. The stiffer frames and forks used on longer-travel bikes also tend to handle loaded riding better than XC-oriented bikes. Point it down and let it go; the suspension will do the work. When you find an awesome trail network along the way, pull off the bags, stash 'em in the bushes and go shred. The only two drawbacks to bikepacking on full-suspension bikes are, in my opinion, the reduced triangle space for framebags and the added complexity inherent in a bike with a linkage. For me, trading some potential frame bag space in exchange for a bike that is more adept on challenging trails is a sacrifice well worth making, and I've figured out some workarounds which I'll discuss in a moment. The complexity of a rear shock and associated pivots adds the potential for show-stopping mechanical failures, so you need to be religious about regular servicing and pre-trip inspections. It’s not a bad idea to carry an extra pivot bolt or two, even if just for peace of mind. For most riders, reaping the full benefits of long-travel bikes requires some dutiful attention to suspension settings. I have one particularly detail-oriented friend who carefully releases air out of both shocks during the course of a long day-ride as the weight of the water in his hydration pack goes down. While many of us probably couldn't discern changes that small, the addition of 20 pounds of food, water, and gear weight is very noticeable when it comes to suspension. Before hitting the trail, I add roughly 10 psi to the rear shock, 5 psi to the front, and up the compression damping slightly to keep the suspension (and my knees) from feeling boggy under the increased weight. You may be able to get away without a seatbag if you’re going for a shorter trip or have companions with whom you can split the load. Strap a seat bag filled with a sleeping kit and clothing behind a rigid seatpost, and suddenly an OTB feels close at hand. I've been bikepacking with a dropper more often than not the past couple years, and the 9Point8 Fall Line has become my preference. It's simple, reliable, and it doesn't develop play from the extra weight of a seat bag like many other droppers do. Unless you're tall or ride a 26er, though, there's likely not a lot of room for a dropper post, rear wheel travel, and a seat bag. 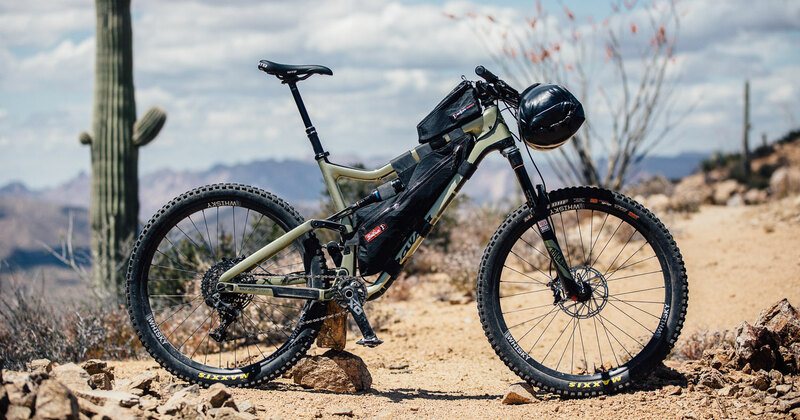 There are a few small bikepacking seat bag options out there, and dropper-specific options from Revelate Designs and Rogue Panda Designs will be available in the near future. I've been using a small prototype from Revelate that allows me to use full rear-wheel travel and about half the dropper post travel (limited with one of RockShox's Enduro Collars). And then the dropper is quickly ready for full use when the bags come off for a quick ride amid a longer trip. 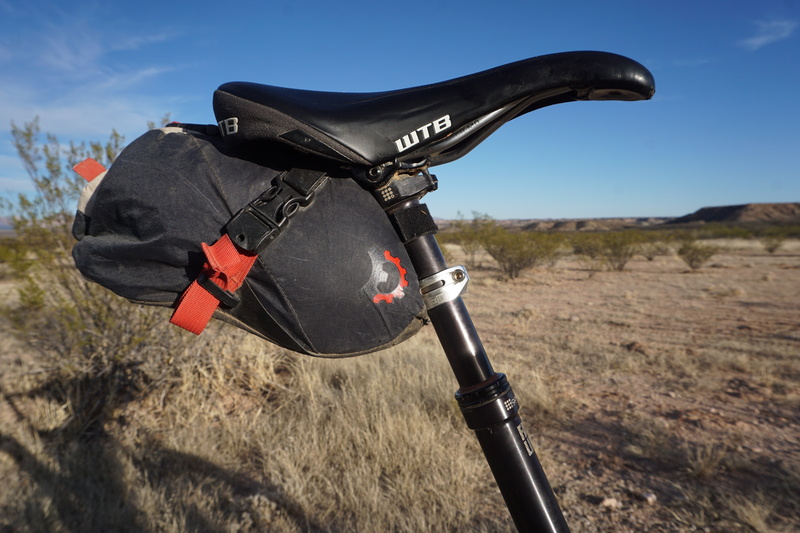 Running a smaller seatbag with dropper posts (or even with rear suspension for riders of smaller stature) requires a sleeker bikepacking kit or compromising by putting more weight on the handlebars, in a backpack or both. This is a compromise I'm eager to make. If I can drop the seat down and get my weight back on descents, a bigger bag on the bars isn't such an issue. 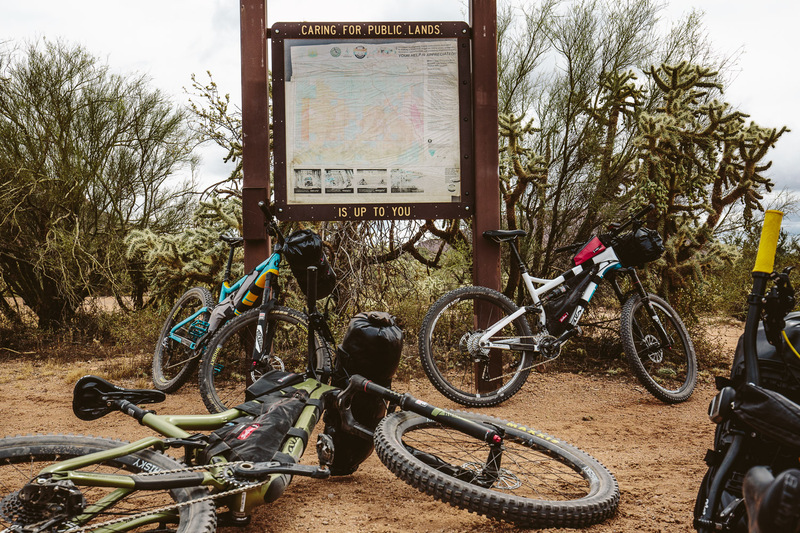 Loaded bikes, steep trails, and typical gearing equate to more bike pushing than the average rider prefers. Easy gearing will allow you to ride as much as possible. I usually run a 26- or 28-tooth chainring for bikepacking, sometimes even putting all dignity aside and slapping a tiny Wolftooth 24-tooth on with my 11-speed drivetrain. Once I'm on trail, I have only ever wished for an even smaller ring. As the mountain bike industry continues to experiment with a handful of wheel diameters and a plethora of rim and tire widths, there's no shortage of options for tailoring your ride to any terrain. For both loaded bikes and larger riders, a wider tire footprint makes for a more stable ride, especially on chunky trails. Some bikepackers prefer 3-inch or wider tires, but my preference is a knobby and generously wide 2.3 to 2.5-inch tire on a rim with an internal width in the neighborhood of 30 millimeters. This adds some comfort and provides good bite, but still feels spry on the trail. A Light Setup is a Fun Setup. This final point isn't about the bike specifically, but rather your entire bikepacking setup. The lower the total weight of the loaded rig, the more agile you'll feel on the trail. If it's packed well and doesn't weigh more than a downhill bike, you probably won't hesitate any more than normal to launch off drops and charge into rock gardens. And big climbs also won't be as daunting. So as you're packing, look over everything you've assembled and pull out anything that you don't really need to bring along. Keep your kit light and simple, and make sure everything is secure. With a few of these tweaks and the right packing setup, your trail bike could become your ideal bikepacking bike. Give it a go. Check out more Fully Loaded.